Ukraine‘s professional heavyweight champion Vladimir Klitschko was on hand to see his compatriot Vasyl Lomachenko prove once again why he is the best in the amateur ranks as the lightweight romped to a second successive Olympic gold on Sunday. Putting two fingers in the air to acknowledge both his second gold and the second for Ukraine at the Games, Lomachenko left the ring draped in the Ukrainian flag. Ukraine’s Yana Shemyakina won gold in the women’s individual epee after a nail-biting 9-8 extra-time win over reigning Olympic champion Britta Heidemann of Germany at the London Games on Monday. Twelfth seed Shemyakina was a surprise winner, having worked her way through the preliminaries. In another fight, Ukrainian world champion Evhen Khytrov was ruled to have lost to Britain’s Anthony Ogogo after an 18-18 countback, despite two knockdowns. The National Olympic Committee of Ukraine protested the decision to AIBA. For a glorious moment, the team (Ukraine) was able to revel in the fact that, after a late miracle, they were the bronze medalists in the men’s team gymnastic competition in the 2012 Olympics. 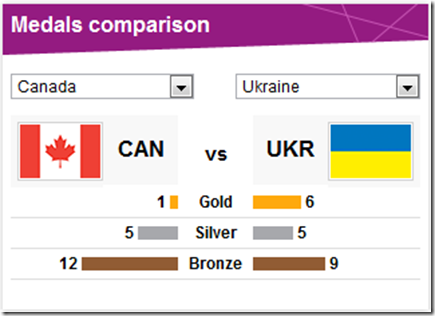 Unfortunately for them, that miracle proved to good to be true, and Ukraine was all of a sudden out of the medals in fourth place. That fourth-place finish is territory that very few felt Ukraine could occupy. Most did not consider them a legitimate medal threat. Consequently, that fourth-place finish should be a great source of pride for the team. Instead, it will now be tinged with the memories of losing a medal they very temporarily owned. Due to a judge’s error, the Ukrainian team must now reconcile the feelings of losing out on a medal they thought they had. The scoring error occurred on Japan’s Kohei Uchimura pommel horse routine. He fell on his dismount and was initially awarded a score of 13.466. This was low enough that it caused Japan to fall from second to fourth, which moved Great Britain and Ukraine up to second and third respectively. However, Japan filed a protest and after minutes of deliberation it was concluded that the judges did not give Uchimura a high enough difficulty score, and his score was raised enough for Japan to hold onto second. As a result, the sport now has a new, highly-visible black eye. Ukraine and Georgia have protested that descriptions of some Russian athletes’ birthplaces on the official London 2012 website make the countries seem like part of Russia. Karolina Sevastyanova, a Russian rhythmic gymnast, is listed as from “Ukraine Region (UKR)”; canoeist Alexey Korovashkov apparently hails from Ukraina Region (RUS). Deputies of Odesa City Council have approved an instruction on the implementation of the law of Ukraine on the principles of the state language policy in Odesa at a special sitting on Monday and gave Russian language the status of a regional language in the city. According to the city council’s instruction, from now on the Russian language may be used on the territory of Odesa as a regional language in offices, official documents, at schools and universities, for advertising and in the municipal toponymy. The fact Canada captured only one gold medal in London doesn’t mean the nation is in crisis. In truth, Canada — aside from the 10 gold medals won at the boycotted 1984 Los Angeles Games — rarely reaches the top of the podium at a Summer Olympics with regular frequency. Beginning with Atlanta in 1996 and right through to the 2008 Beijing Olympics, Canada has won exactly three gold medals in each of those four Games. In terms of overall medals, Canada’s 18 in London equals its Beijing output, and ranks second to the 22 earned in Atlanta — the most ever by a Canadian team in a non-boycotted Olympics. it was the controversy with Canada leading 3-2 that will always define this contest. That’s when Norwegian referee Christiana Pedersen transformed herself into one of the most infamous figures in Olympic history. In a sequence of calls that set off a firestorm from both the Canadian players and a few media outlets outside the U.S., Pedersen called goalkeeper Erin McLeod for holding the ball too long, which led to a free kick inside the Canadian box. While a six-second infraction does exist in the rulebook, the enforcement usually comes with a warning, one McLeod said she never received. The referee then awarded the U.S. a penalty kick when Marie-Eve Nault was charged with a handball. Abby Wambach converted that chance with less than 10 minutes remaining before Alex Morgan’s header in the final minute of extra time buried Canada, and sent the Americans on their way to another gold medal following their 4-3 win. The loss could’ve ruined Canada’s chances against France in the bronze match, but the women were still playing for history. Diana Matheson’s dramatic goal in the 92nd minute gave Canada a 1-0 win and landed the country its first medal in a traditional team sport since 1936. Canada’s lone gold medal of the Games came from an unlikely source. Heading into London, Rosie MacLennan competed in the rather large shadow of three-time Olympic medallist and trampoline great Karen Cockburn. That changed when MacLennan, of King City, Ont., executed a brilliant routine to capture gold. MacLennan has to wait to celebrate as 2008 Olympic champion He Wenna of China pressed hard during her last routine. To everyone’s amazement, He tumbled on her last manoeuvre, sending MacLennan into Olympic history. By winning a bronze medal in the women’s three-metre synchronized springboard event with partner Jennifer Abel, she became the first Canadian ever to win a medal in four straight Olympics.